A successfully made Red Velvet Cake! 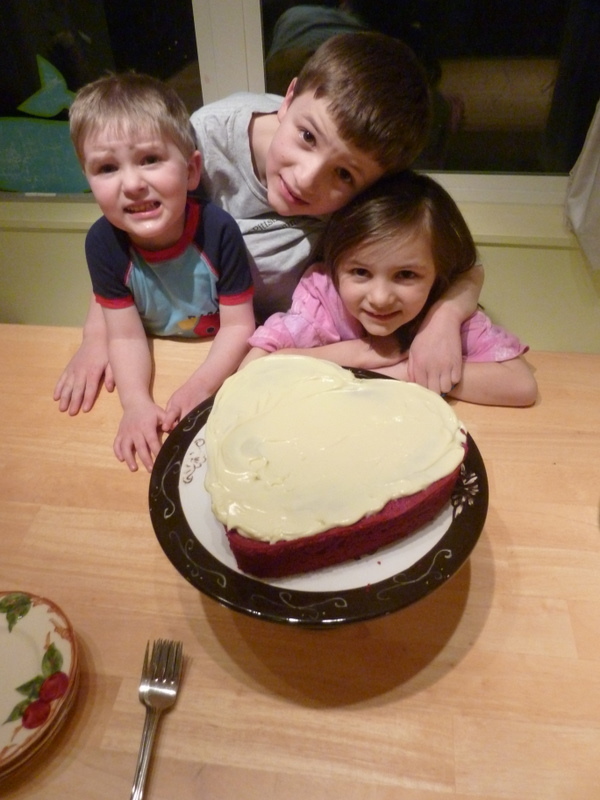 I attempted this same cake recipe last Valentine’s, and it was not pretty. I didn’t have the right size cake pan, so the batter overflowed in the oven, and what was left in the pan collapsed into a big cake crater. 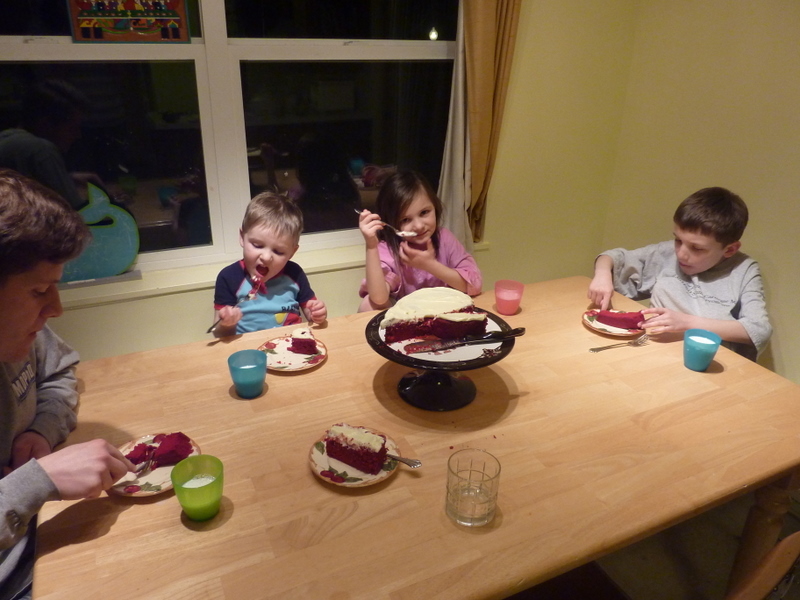 Oh, and I didn’t have enough red food dye, so the cake crater was the color of Spam. But this year, I invested in the proper pan, and a full ounce of dye (that’s what you need, apparently) and lo! A cake worth destroying! A happy Valentine’s was enjoyed by all! Hmm. 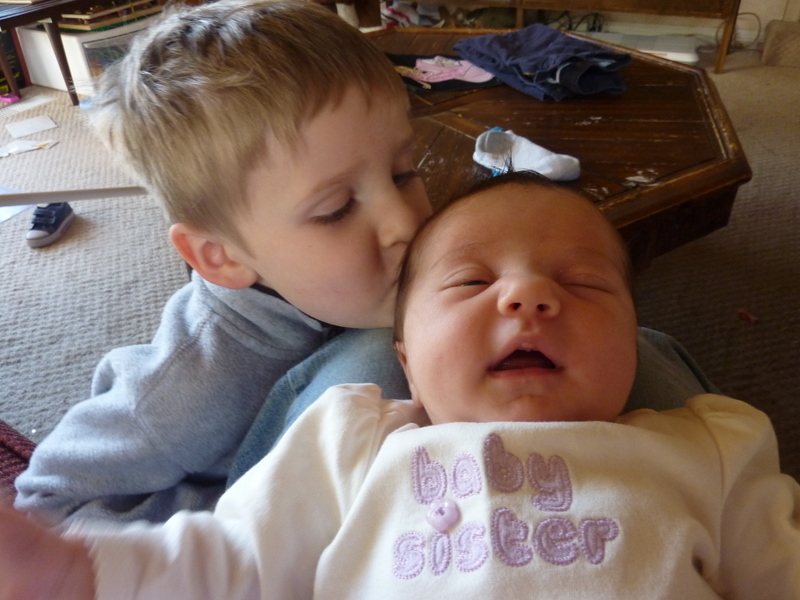 On second thought, I think I’ll count this last picture as my Valentine’s present. Yum. We spent a good part of the week constructing lacey construction papery thingies to mail off to grandmas, be handed over to classmates (which usually results in their immediate destruction) or taped on our dining room wall until St. Patrick’s Day or Easter, whichever holiday compels me to re-decorate first. 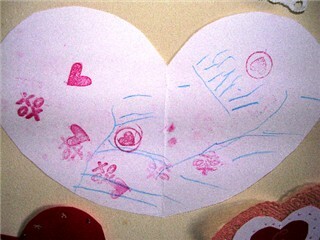 This is a valentine that Eleanor made. Brian and I had been spending a lot of time coaxing Jeffrey to scrawl a “J” on each of his valentines, and in the middle of this, Eleanor decided on her own that she would like to write an “E” on her valentines. See those shaky blue laddery things? That’s the letter E. I’m so proud of her! This thing might be on the dining room wall until June. Oh, how I loves it so.